【Plug & Play】: No need extra Apps or phone cables. 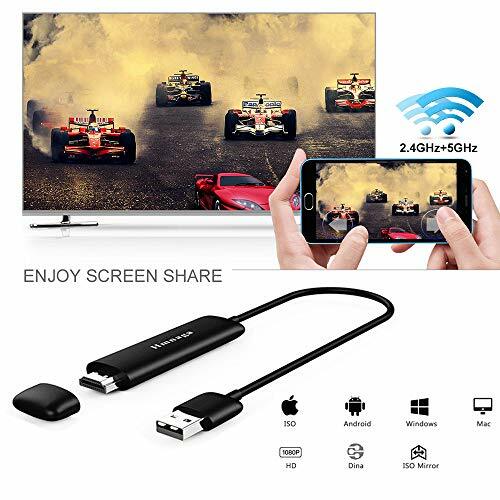 Just plug in the adapter to your HDMI-Enabled devices and USB adapter or interface, Search and connect the WiFi, Mirror the media from your phone/tablet, three steps only! 【Full HD 1080P Display】: Stream 1080p videos, games, audio, pictures, apps and files from your mobile to your big HD TV, beamer and monitor. Support HDMI 1.4; A 1080P full HD output provides the perfect experience. 【Broad Application】: You can perfectly to enjoy the ultimate big screen: Watch movies, play games, create your own exclusive cinema. Easy to carry,perfect for presentation in the office or at school (Powerpoint, Excel, Word, PDF and pictures from the smartphone, tablet to the HD TV or beamer, Projector).